Airlines profited up to €1.36 billion last year by passing “imaginary” costs from the EU’s Emissions Trading System (ETS) onto consumers, says a study by a Dutch environmental consultancy published today (22 January). EU airlines stood to gain the most from the carbon trading scheme – some €758 million or almost twice their estimated returns of €400 million in 2011 – says the CE Delft study. Under the ETS, the EU’s market-based measure to curb greenhouse gas emissions, airlines are given a certain number of free carbon allowances. The rest they have to purchase on a ‘carbon market’. The free allowances covered some 85% of the sector’s emissions in 2010. The remaining 15%, plus any allowances to cover any emissions increases since 2010, needed to be purchased, with airlines recovering their costs through higher air fares in 2012, according to the environmental campaign group Transport & Environment, which commissioned the study. Aoife O’Leary, an aviation advisor at T&E, told EURACTIV that airlines were passing on the “imaginary costs” of the free ETS allowances onto customers, generating huge profits. “Evidence suggests that airlines have not only been raising ticket prices to fund the permits they need to purchase, but they have also been passing on much of the ‘cost’ of the 85% free allowances to customers, and consequently, generating windfall profits,” said a statement by T&E. O’Leary said airlines treated carbon allowances like any other asset, passing their costs onto customers or selling the surpluses. “Despite receiving allowances for free, companies charge their customers for the full value of these allowances to enhance their profitability”, the statement said. These windfall profits amount to some €870 million for all airlines, if the full value of the free permits were charged to passengers. 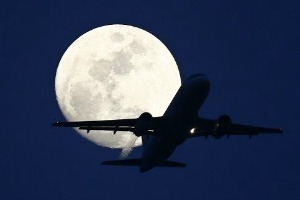 The ETS for airlines took effect in 2012 amid opposition from international carriers. Flights entering or leaving the EU are temporarily excluded from the ETS to give the International Civil Aviation Organization (ICAO) more time to develop a global approach to aviation emissions under a European Commission proposal known as ‘stopping the clock’. But the study claims that airlines continued to pass the carbon costs onto customers of intercontinental flights, despite no longer having to pay for the permits under the ETS. The extra revenue generated to pay off the carbon allowance then translated into additional profits for the industry, it said. The Association of European Airlines, which represents major passenger carriers, declined to comment on the study, saying: “Part of the conclusions is based on assumptions and not on facts or reality. It is not known at which price airlines have bought certificates. The ETS is the target of repeated criticism from industry and environmentalists that it does little to protect the environment. The value of carbon on the market fell by 36% last year, according to Bloomberg New Energy Finance. As a result, speculation has mounted that the Commission will intervene in the ETS, by ‘backloading’ some 900 million allowances until 2019 and 2020. The International Air Transport Association (IATA) dismissed the findings of the CE Delft study, claiming that the report offered a "simplistic analysis of a complex situation". “The report is light on facts and very heavy on assumptions," said Tony Tyler, IATA’s director general and chief executive. "The industry’s 1% net margin in 2012 indicates just how much airlines struggle to cover the real cost of air transport in air fares. Suggesting that airlines have been able to recover hundreds of millions of Euros from passengers for costs that they did not face is ludicrous." Examples of shortcomings that IATA singled out in the report include frequent usage of terms such as 'assume', 'probable', 'uncertain', etc., which appear at least 50 times in the CE Delft report. In another instance, the report contradicted itself by claiming in one part that Chinese airlines were prohibited from raising ticket prices and suggesting afterwards that Air China made €3.7 million windfall profit. "It is surprising that CE Delft has put their name to research of this quality," IATA said. "if airlines profited from the ETS so much, why would they oppose its implementation?" CE Delft refuted those claims, saying that airlines "had no other choice than to pass on additional ETS costs to the consumer since January 2012". "They simply did not have enough profits to absorb these costs in their margins," said Jasper Faber, aviation and maritime specialist at CE Delft and author of the study. "Several airlines have explicitly stated that they would levy surcharges to recoup ETS related expenses. The sudden and unexpected change in the ETS means that the revenues have been raised at least until November 2012, but airlines do not have to pay associated costs. The simple arithmetic conclusion is that airlines have made a profit because of the change in regulation," Faber said in comments emailed to EURACTIV. As most airlines do not reflect ETS-related costs in their accounts, the report had to make assumptions, Faber continued. "It is good scientific practise to indicate assumptions with words. This does not mean that the results are uncertain," he said. "A different but related question is whether airlines have passed through the value of freely allocated allowances. In many other ETS sectors, this has been empirically proven. This is in line with economic theory, which predicts a full pass through in competitive markets. There is no reason to believe that the situation in aviation is any different. However, to account for the possibility, however slight, that aviation has not passed through the opportunity costs, we have presented two different and transparent scenarios in the report." It originally applied to industries and utilities but took effect for airlines on 1 January 2012. It involved imposing a cap on carbon dioxide emissions for all planes arriving or departing from EU airports, while allowing airlines to buy and sell 'pollution credits' on the bloc's carbon market, and so reward low carbon-emitting aviation. Non-EU governments and airlines have battled the EU, threatening trade wars and retaliation for European airlines flying to other countries. No, this is not “outright fraud.” The CE Delft Report is inaccurate and incomplete. Airlines have been working on reducing CO2 since 2008. This is taken tremendous investment in new aircraft and engines (which do not produce as much CO2) and new biofuels which reduce total CO2 from source to use. More than 20 major airlines around-the-world are working with SkyNRG, Solena (“GreenSky London”), Solazyme, Sapphire Energy, UOP, etc. Carriers like LH have run tests for 6 months (FRA-HAM with an A321 aircraft). What was the cost of these tests with aircraft manufacturers and engine makers? What about recent investments like IAG’s British Airways in Solena’s GreenSky London facility to produce biofuel for the U.K. airports from algae? (500M USD investment). The FACTS are airlines have invested far more at reducing long-term CO2 than the temporary delay of the new EU carbon fees. The CE Delft Report is incomplete.